Sonya, Tim and son Luke of West Carrollton met red boy Flying Galatian and within five minutes, he was roaching!! He worked the room and had this family convinced he was home in no time. Now called Kruzer, he connected very quickly particularly with Luke, whose birthday is the day after adoption day. Tim and Sonya did a lot of research and knew this was definitely the breed for them. They are already thinking about greyhound #2 down the line! 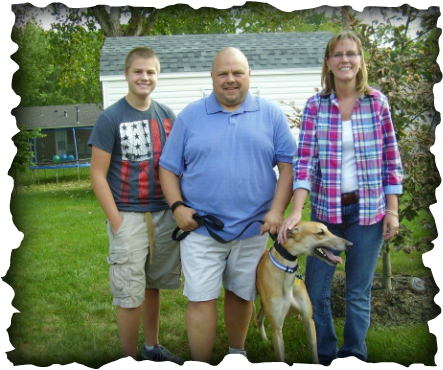 We hope to see Kruzer and his new family at future GAGC events.